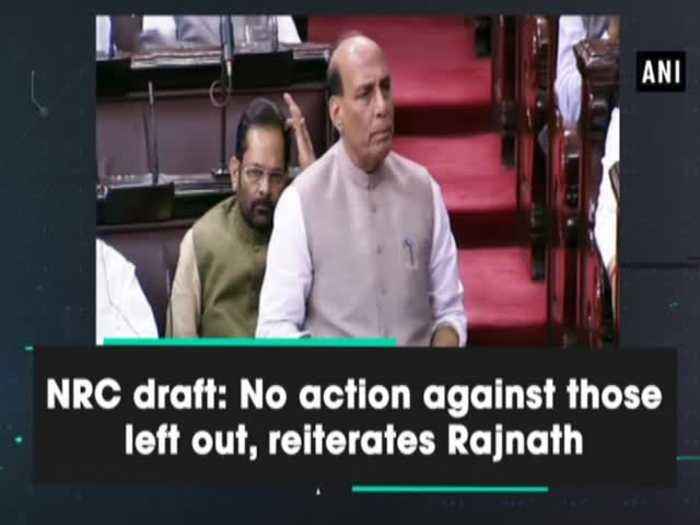 New Delhi, Aug 03 (ANI): Home Minister Rajnath Singh on Friday categorically reiterated that no coercive action would be taken against anyone whose names are not mentioned in Assam's National Register of Citizens (NRC) final draft. While addressing the Rajya Sabha, Rajnath condemned the attempts to create an atmosphere of fear among people and said "I am saying this again, that no coercive action will be taken against anyone in any situation. Attempts to create an atmosphere of fear are condemnable. The whole procedure of Assam NRC was undertaken under supervision of Supreme Court".